One Voice Mixed Chorus Almost Legal! 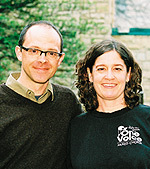 Observing its 20th Anniversary, One Voice Mixed Chorus will celebrate by throwing a bash showcasing two decades of vibrant music and social change. The show will honor both past and future, as the chorus looks ahead to another two decades of expert music-making, community outreach, and positive social change. The concert—titled Old New Borrowed Q: Celebrating 20 Years!—take places June 21, 7:30 PM, and June 22, 3:30 PM, at the History Theatre in St. Paul. Tickets can be purchased online at www.ovmc.org or by calling (651) 298-1954. Reverend Robyn Provis is coming back to All God’s Children Metropolitan Community Church in Minneapolis. 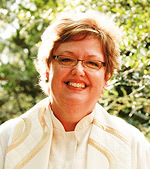 Until recently, she was serving a one-year appointment as Interim Senior Pastor for MCC Austin in Austin, Texas. When the All God’s Children MCC Board of Directors learned of her return to the Twin Cities, it got busy fund-raising, with an overwhelming response, taking in enough for one year’s salary. A graduate of Pacific Lutheran Theological Seminary in Berkeley, California, Provis is a doctoral student at the Episcopal Divinity School, studying the positive connection between diversity and congregational vitality. She is the former National Media Director for Soulforce. She lives in Richfield with her partner, Kathy Luebbe. For more information, visit www.agcmcc.org. The Tretter Collection at the University of Minnesota Libraries marked the 75th anniversary of the burning of the Hirschfeld Library in 1933 by the Nazis. 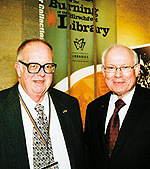 To the best knowledge available, it was the world’s first library to contain primarily GLBT items. The Tretter Collection has a number of items from the library that survived the Nazi purges and the rest of World War II. On May 2, the Tretter Collection featured special guest Dr. Heino A. P. Beckmann, Honorary Consul for the Federal Republic of Germany.